Blu-ray XL or BD-XL is a recordable Blu-ray disc format consisting of multiple layers with a current disc capacity of 100 gigabytes. It adds a third recording layer and boosts storage in contrast with its single and dual layer predecessors. These older BD formats could hold 25 gigabytes and 50 gigabytes respectively. The inner diameter of the BD-XL is 24 millimeters, the outer diameter measures 118 millimeters. These discs are available in 2x and 4x speeds. A high capacity prototype of BD-XL was in development and testing nearly a decade before its commercial release. In 2002, a 100GB model was created in Taiwan. TDK developed a quadruple version that was intended for commercial viability by 2007 but it did not pan out. 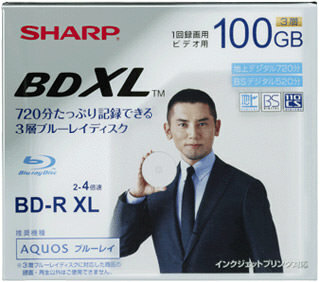 Only in 2010 did Sharp Corporation release the first BD-XL, known as the VR-100BR1, to the public in Japan on July 30, 2010. A market launch for the United States and other global markets has yet to be determined. Additionally, a format size of 128 gigabytes and four recording layers is a permitted standard for future Blu-ray XL discs. The 100 gigabyte Blu-ray format translates to a storage capacity of approximately 12 hours of terrestrial digital television, or just over 8.5 hours of satellite television. To give you some perspective, a user could store up to 11 episodes from a TV series on one disc, which could be an entire season in some cases. In addition to home entertainment uses, industries with archiving needs including healthcare and finance may find the 100GB capacity suitable as it may require fewer discs to take up valuable physical storage space. BD-XL has a notable hard coating that shields the disc from extraneous elements like fingerprints, scratches, and dust that can undermine its writing and recording quality. The coating also serves to help with on-disc printing and labelling. Writing with water or oil-based pen can occur up to the boundary of the 24mm center hole. BD-XL lacks backwards compatibility with current and past hardware, including computer drives, as well as home entertainment players and recorders. However, compatible Blu-ray devices were released simultaneously to the Japanese market with the VR-100BR1 discs: the BD-HDW700 and BD-HDW70. This hardware is part of Sharp’s AQUOS series and possess the ability to record and playback the 100GB Blu-ray discs. Backward compatibility with older Blu-ray media formats, as well as DVDs and CDs, is a standard function for these models. Their 1 and 2TB hard drives can also playback Blu-ray 3D discs.